The Audio2000'S APM1062 microphone is an entry level cardiod dynamic microphone and is ideal for home use or as a backup microphone. The APM1062 microphone has a round-headed steel mesh grille, a durable microphone casing with a special leatherette finish, and a low impedance capsule providing excellent transient responses and wide frequency response. The Audio2000'S ADM1064 microphone is one of the ADM106X dynamic microphone families which present excellent value to music, pro-audio and karaoke market segments. With professional appearance and performances, the ADM1064 microphone is configured with a round-headed steel mesh grille, a durable zinc microphone casing plated with a deep metallic finish, and a low impedance capsule inhering excellent transient responses and wide frequency response. Right from the early product development stages, the ADM1064 microphone has been intended to be designed and manufactured as a dependable, versatile and, yet, economic sound reinforcement tool. As a result, a delicate sound performance and the delicately designed and finished surface make the ADM1064 microphone an outstanding value in any vocal applications. It is suitable for either the beginners or the professional users. The Audio2000’S® APM1066 is a versatile professional dynamic microphone of exceptionally high quality. A super efficient magnetic circuit design utilizing an AlNiCo magnet element provides maximum output level for improved signal-to-noise ratio for all vocal and sound reinforcement applications. The APM1066’s frequency response is optimized for the vocal application by controlling the proximity effect through its low-frequency rolloff. The APM1066’s extended high-frequency response significantly enhances the sound reinforcement clarity. Throughout the APM1066’s full frequency range, the cardioid pattern stays uniform and symmetrical to significantly cut off any feedback and off-axis coloration. An advanced design in the shock-mounted microphone element and the delicately finished surface keep the handling noise extremely low. The extraordinary features of the sound clarity and transparency, high output, extremely low handling noise, uniform cardioid pickup pattern, and delicately designed and finished surface make the APM1066 microphone an outstanding microphone for any critical vocal applications. 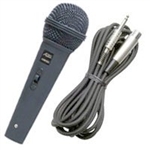 The standard APM1066 package includes an APM1066 microphone, a soft-rubber microphone clip, a pouch, and a 20' microphone cable (XLRF-XLRM or XLRF-1/4") in a deluxe colored cardboard box. The Shure PG48-QTR Vocal Microphone comes complete with a 15', 1/4" phone cable and clip for plug and play convenience. The dynamic cartridge offers rugged, reliable performance and its cardioid pattern rejects noise and minimizes feedback. Built-in pop filter and on-off switch. Includes clip, mic pouch, and educational guide. 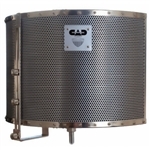 The CAD Acoustic-Shield 32 Stand Mounted Acoustic Enclosure suppresses and controls acoustic reflection, ambiance, noise and leakage during vocal and instrument recording in professional and project recording environments alike. The Acoustic-Shield 32 features a sturdy semi-circular steel frame and is lined with high-density 53mm micro cell acoustic foam. An assortment of mounting hardware is included and allows for slide-adjustable positioning in height and depth. The Acousti-shield 32 is constructed from a high quality 16-gauge perforated stainless steel shield. The shield is mated to a 53mm high-density micro cell acoustic foam, resulting in a dry recording environment. Effectively reduces reflections, echo and attenuates unwanted environmental acoustic interference. Innovative advanced mounting design allows for maximum positioning stability even when mated to an economy mic stand. Innovative microphone positioning flexibility accommodates a variety of microphone designs and allows for creative control and a tailored acoustic result. The portable design allows for easy studio placement and simplifies remote recording. Featuring sleek, stackable, contemporary styling, Audio-Technica's ATW-801/G System 8 VHF guitar wireless system is designed for reliable performance, easy setup and clear, natural sound quality. These single-channel, fixed-frequency systems are available in three traveling VHF frequencies (169.505, 170.245, and 171.905 MHz). The Audio-Technica ATW-801/G includes an ATW-R800 receiver and ATW-T801 UniPak transmitter with AT-GcW guitar/instrument input cable. The ATW-801/L VHF wireless bodypack system with omnidirectional lavalier microphone features sleek, stackable, contemporary styling. Audio-Technica's System 8 Wireless Systems are designed for reliable performance, easy setup and clear, natural sound quality. Let the Shure 520DX Green Bullet Mic give you that warm, distorted Chicago blues tone associated with Little Walter. Dual-impedance internally selectable, built-in mic cord, supplied with 1/4" phone plug connector. The ATW-801/H wireles body pack system comes with the ATW-R800 receiver and ATW-T801 UniPak® transmitter with PRO 8HEcW headworn microphone. Featuring sleek, stackable, contemporary styling, Audio-Technica's System 8 Wireless Systems are designed for reliable performance, easy setup and clear, natural sound quality. The GXL3000’s capsule features a 1” gold-vapor deposited multi-pattern (Cardioid, Omni, Figure 8) dual diaphragm for exceptional accuracy and sonic performance. Switchable polar patterns make it extremely versatile in a variety of applications. The microphone’s high sensitivity and extremely low distortion make the GXL3000 an ideal candidate for recording and sound reinforcement including vocal and instrument applications. Features include a 80 Hz hi-pass filter and 10 dB pad. Shock mount and vinyl pouch included.